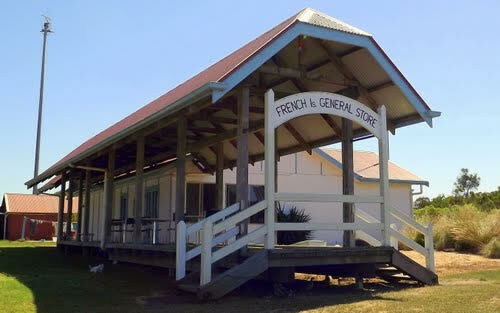 In May 2016 new owners took over the French Island General Store (FIGS) which is the only shop on the island and incorporates a café, grocer, post office, newsagency, bottle shop and bike hire. Catering to all these needs means the store has daily loads of 35-40 kWh. The store supports a little over 100 permanent residents and the many tourists that come to visit Victoria’s largest coastal island. Although located just 70 km from Melbourne’s CBD, it feels like a very remote location with no mains gas or electricity and no sealed roads. 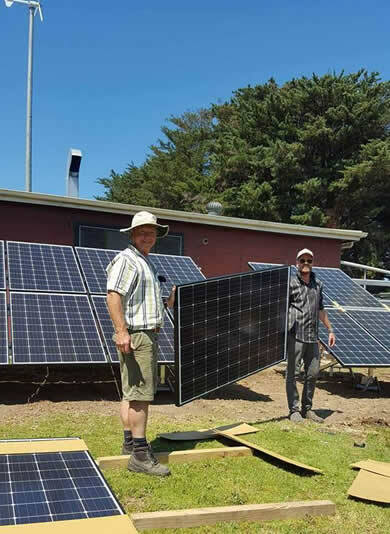 When the new owners took over they were saddled with a 5 kW wind turbine and a dead set of under-sized batteries which meant that they were forced to run their generator 24 hours a day. A new set of batteries and the addition of solar panels were essential. The installation had to be carefully planned as all equipment had to be shipped over from the mainland by barge. The first stage of the project was to replace the batteries which reduced the generator runtime by approximately 5 to 10 hours a day. 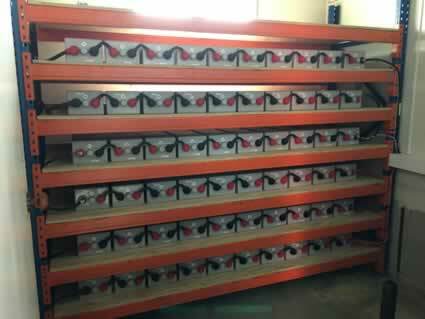 Trevor sourced second-hand pallet racking to support the greatly enlarged 3 tonne battery bank. 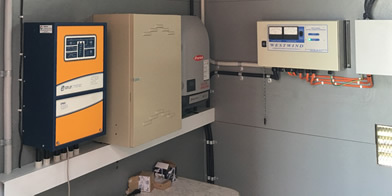 The site already had a Selectronic SP PRO Series I inverter installed. Selectronic prides itself on the longevity and future-proofing of its products. The recently released Selectronic Certified Fronius Primo inverter is compatible with the previous version of our SP PRO. 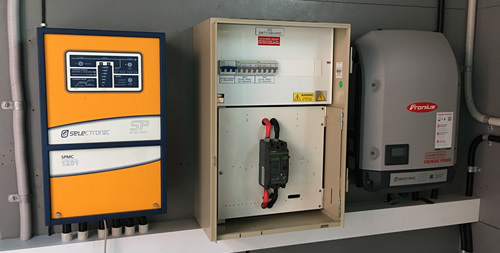 This compatibility meant that new components ­­- the string inverter and solar panels - could be added to the still working but superseded SP PRO. In January 2017 ground-mounted solar was added to the renewable energy mix. Surefoot footings were used and saved $1500 by omitting the need for concrete. Now that PV had been added, the generator is being run only 10-12 hours per week. The owners of the French Island General store are thrilled with their upgraded, efficient renewable energy system. Not only are they saving $15,000 per year in diesel fuel but there are additional savings in frequency of generator servicing. The noisy generator no longer operates at night as there is enough stored energy in the batteries to service the night loads. The combination of wind/solar works particularly well on French Island. If it’s not sunny then it’s likely to be windy so there is consistent production of renewable energy. The upgraded power system will enable the store to expand their dining area and add a much needed petrol and diesel station to provide fuel for the local cars and tractors etc. The 5kw Westwind turbine can be seen in the background.